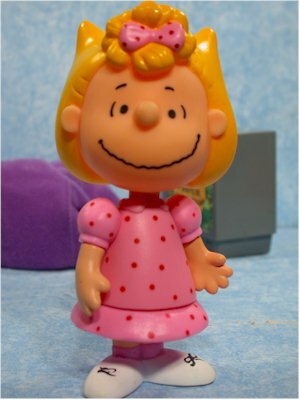 One of the most anticipated lines of 2002 is finally on the shelves - Peanuts! 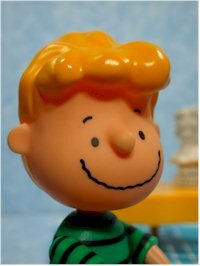 The first set of figures is under the name "Good Ol' Charlie Brown", and are the basic assortment of six figures. There's Charlie Brown of course, along with Lucy, Linus, Snoopy, Sally, and Schroeder. In the initial cases it appears that Sally and Linus are short packed to one per case. In subsequent shipments, they'll swap out certain figures and add in new ones. In the next set we should see Pepperment Patty, and in the assortment after that Pig Pen. 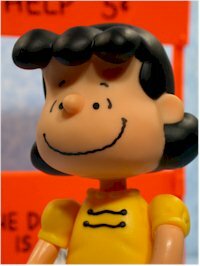 Charlie Brown and Snoopy will always be in each assortment but they will be altered each time. I have no idea what the fully means. They are also packing the figures on single cards, like I bought these, and in boxed sets of three to a box. The single carded figures were $8 at Target, while the three packs were $16, and clearly the better deal. The bubble packaging is fairly attractive, it's eye catching on the peg, and shows off the figures well. The rest of the series is pictured on the back, and the upcoming School Room playset with Sally is mentioned as well. I don't think they'll hold up as well as some to shelf wear, since the bubbles have to be fairly large to hold the figures, but overall it's decent packaging. The head sculpts are all great, and help carry the figures. I'm not thrilled with the hollow soft rubber - the heads remind me of dog chew toys - but it's acceptable. When I was a kid I had these terrific figures from Warner Brothers of the cartoon characters, and I think because of those I have a better appreciation for this type of rubber head. I had a major issue with the soft plastic on one figure though. Snoopy has a twisty tie around his neck, and mine was very tight. So tight that it caused him to have a deformed neck. As you can see in the photos, my poor Snoopy has an odd tilt to his head because of it. Be careful picking out that particular character. The bodies are very short of detail. The hands have very stubby fingers, and the details on the collars, clothes, and shoes is extremely basic. Don't get me wrong - I don't expect these to be Muppets level quality. They are simply 2D characters, and they shouldn't have that level of detail. But poor Snoopy's arms are barely stubs, and the overall detail on the sculpting is less than I'd hoped. It's not terrible - they still are getting three stars in this category - but it could have been better. Another major knock to the sculpting is the hands - none of the characters can hold any of the accessories. 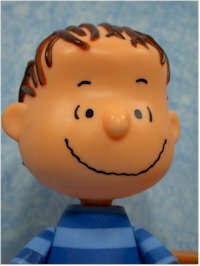 Charlie can't hold his kite, Linus can't hold his book, and although there aren't a lot of accessories here for the characters to hold, better hand sculpts would have been nice. The bodies are made of a solid plastic, but like the heads their hollow, so the figures are very light overall. For me, there's nothing worse than getting geeked up over an upcoming line, and then being disappointed. That's unfortunately the case on these figures in a few areas, paint being the worst. The faces are fairly well done, with clean lines on the eyes, eyebrows and mouth. The clothes aren't nearly as good. 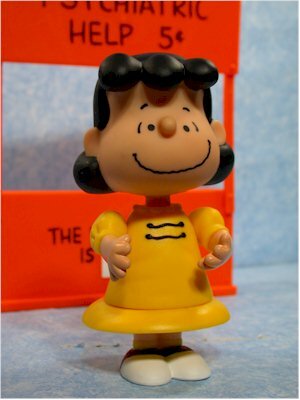 Some figures, like Lucy, had sloppy lines all over - around her dress, shoes, socks, etc. 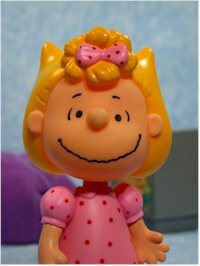 Others, like Schroeder, really came out all right. It looks like a real crap shoot as to whether you'll get a figure with decent paint ops or not. The paint work was hit or miss on the accessories as well, and some of the paint - particularly the skin tones on the arms and hands - is gloppy and thick. The articulation on these figures is slightly unusual. There's neck, shoulders, cut elbows, and waist on the majority. The neck, shoulders and waist all work as you'd expect. The elbow joint simply twists, allowing you to turn the hand to different positions. 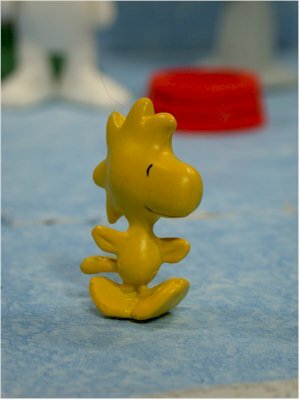 Two of the figures break this rule - Snoopy has neck, shoulder, ankle, and a weird waist joint that is at a 45, instead of a horizontal line. 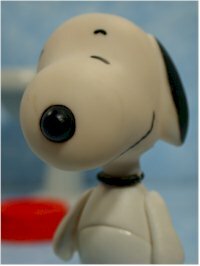 This unique waist joint allows Snoopy to sit down. 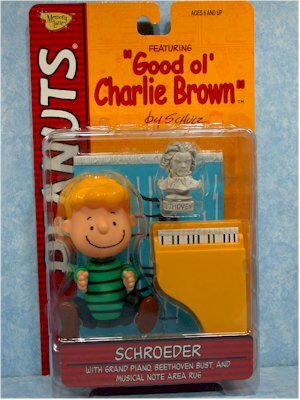 I would have given them another half star on the articulation because of Snoopy's ability to stand and sit, until I opened Schroeder. They took away his articulation, and although he has a waist joint it's completely useless. He is permanently in a sitting position, and only had neck, shoulder and cut elbows. Easily the best thing about these figures are the accessories. All of them come with sensible extras, and they are well designed. 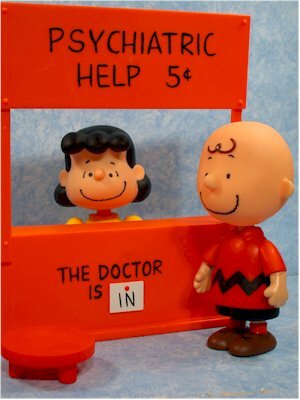 Lucy has her psychiatrist's stand, along with a little chair. 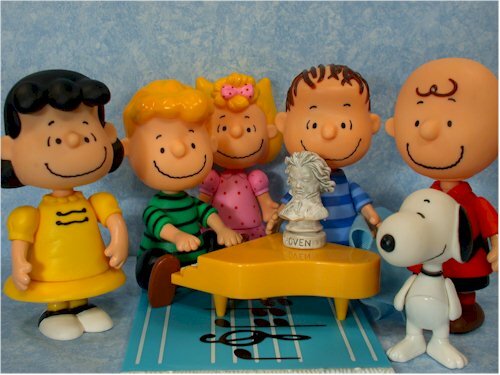 Of course, only Snoopy or Schroeder can sit on the chair. But the details and size of the stand is great. 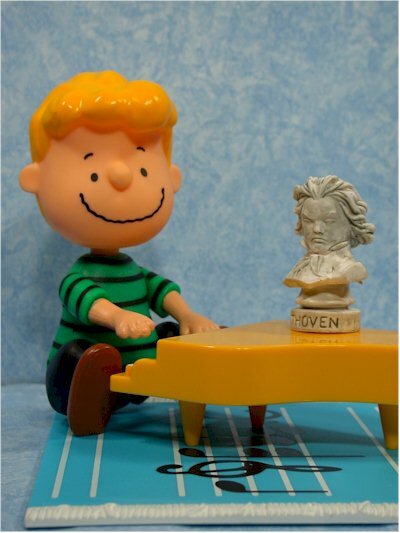 Schroeder has his trademark piano, the bust of Beethoven, and a plastic 'carpet' with musical notes. The detail on the bust shows how good the work Playing Mantis can do when they set their minds to it. 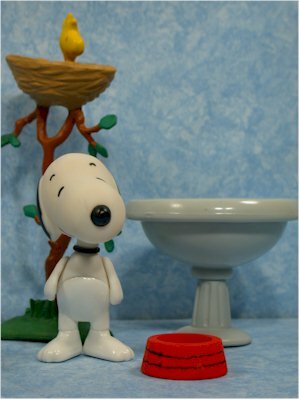 Snoopy has four accessories - the large bird bath, small water dish, his bird buddy Woodstock, and Woodstock's nest up in a tree. The sculpts on all of these are nice, although Woodstock is a light on detail. His feet are sculpted in a walking position, which means he can stand on his own. 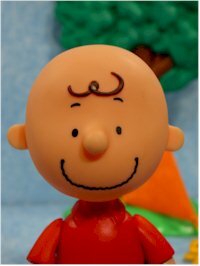 Charlie Brown had the only disappointing accessory. 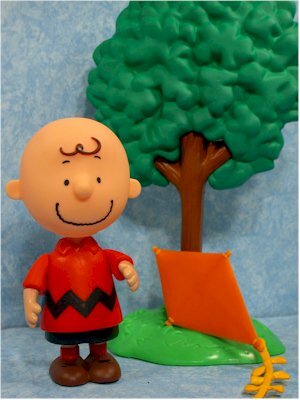 The large tree is great, but the quality of the paint and plastic used on the kite is just plain awful, and the fact that Charlie can't hold the kite AND you can't stick the kite into the tree in any way (how else would you want to display it?) means it's pretty useless. 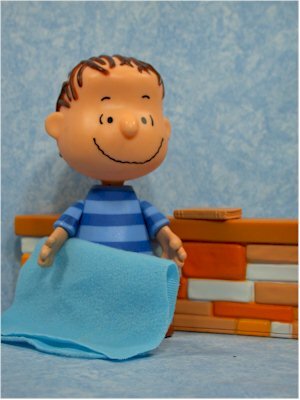 Linus has his blanket of course, although it's just a square of material. You'll have to beat it up some yourself to get it too look much like his blanket. He also has a section of wall, and a philosophy book, which he can't hold in his hand (but can tuck under an arm). 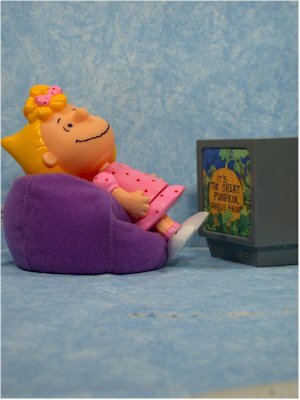 Sally, has a TV (with the Great Pumpkin show on the screen - although she wouldn't be watching a show about the strip...) and a neat little bean bag chair. Hey, those are the perfect accessories for her, and although she doesn't fit perfectly into the bean bag, it works reasonably well. Even though the accessories are great, and the sculpts on the heads good, these aren't eight dollar figures. But if you can find the boxed sets for $16, that's a far better deal, and brings them down to just over $5 each. I'm not sure I'm being completely unbiased here. I may be giving these a half star more than they deserve, because of my nostalgia for the license. So let me see if I can weasel my way out of it - if you end up paying $8 each for these, they get an overall score of **1/2. But if you can find them for under $6 each, they get *** overall. The biggest disappointment here is that these aren't as good as the Rudolph series. Playing Mantis did an absolutely marvelous job with that line, and I was expecting something similar here. I'll be buying all the unique characters, but if the quality doesn't improve, it's unlikely that I'll buy any silly repaints or simple accessory changes. 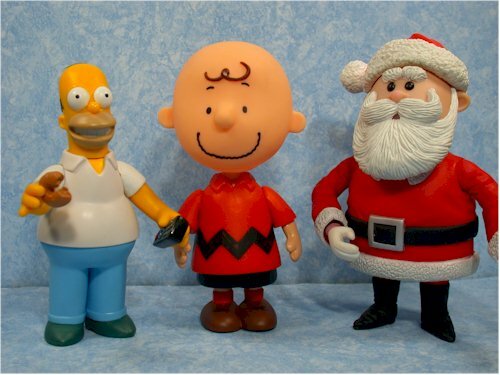 I've included a picture down below that shows the scale of these figures compared to the Simpsons and the Rudolph line. In two days I'll have a review up of the six figures from the Great Pumpkin series. - Comics Infinity has the 3 packs for $17 each, and the Snoopy Doghouse playset for under $19. I've gotten terrific service from them every time I've ordered through them. Search for the term 'peanuts' and they'll all come up. - Beans Toys has them in sets for $36 (in the three packs). They are still a pre-sell.